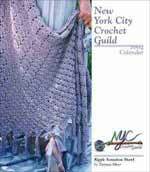 My NYC Crochet Guild 2004 Calendar, which I just ordered Friday, arrived today. Yay! I’m not a member of the NYCCG and I’ve got lots of calendars, but how could I not support the only crochet calendar in America? (As well as the fabulous YearBox folks who produced it.) It’s quite nice, the colors are crisp and vivid, and the laminated sheets will be durable. I love the format–a CD-sized box that flips open to make a stand. I’m particularly fond of the March pattern, Elegant Cardigan by Olga Kreidik. And there’s a chic hat in the November pattern (Purple Passion Hat and Scarf Set by Willena Nanton), which is made in four shades of purple worsted weight yarn with an eyelash yarn trim aroud the bottom.